Beginning with a proclamation by President John F. Kennedy in 1962 designating May 15 as Peace Officers Memorial Day, National Police Week has blossomed into a nearly monthlong commemoration during which tens of thousands of law enforcement officers from around the world meet in Washington, D.C., to honor those officers who lost their lives in the line of duty. PORAC members participated in a number of National Police Week events, including a candlelight vigil held Sunday evening, May 13, on the National Mall. Coinciding with National Police Week, PORAC members also had their second fly-in of the year and met with U.S. Attorney General Jeff Sessions and key members of California’s congressional delegation and their staff, as well as staff on several committees considering legislation important to law enforcement. 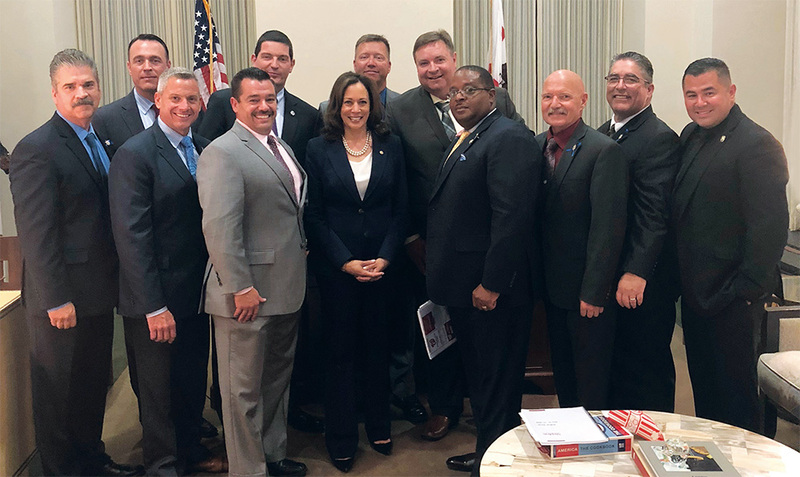 Over two days, PORAC met with Senator Kamala Harris (D) and Representatives Doris Matsui (D-6th), Paul Cook (R-8th), Eric Swalwell (D-15th), David Valadao (R-21st), Salud Carbajal (D-24th), Julia Brownley (D-26th), Pete Aguilar (D-31st), Norma Torres (D-35th), Duncan Hunter (R-50th), Juan Vargas (D-51st) and Scott Peters (D-52nd). PORAC also met with staff from the offices of Senator Dianne Feinstein (D) and Representatives Mark DeSaulnier (D-11th), Barbara Lee (D-13th), Ro Khanna (D-17th), Steve Knight (R-25th) and Jimmy Gomez (D-34th), as well as majority staff on the House Education and Workforce Committee and House Judiciary Committee. Funding for DOJ Grant Programs: During those meetings, PORAC members advocated for full funding of the Department of Justice’s (DOJ) Office of Community Oriented Policing Services (COPS Office), the Edward Byrne Memorial Justice Assistance Grant (Byrne-JAG) Program and other community policing funding initiatives. They also urged for the passage of a number of bills aimed at supporting law enforcement and enhancing community safety. Survivor Benefits: PORAC members advocated for H.R. 5060, the Heroes Lesley Zerebny and Gilbert Vega First Responders Survivors Support Act of 2018, to increase the death, disability and education benefit amounts under the Public Safety Officers’ Benefits (PSOB) Program. The PSOB Program provides benefits to eligible public safety officers whose injuries (or deaths) were sustained in the line of duty. 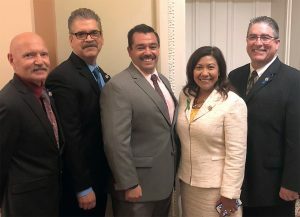 The bill, co-sponsored by California Representatives Raul Ruiz (D-36th-Palm Desert) and Paul Cook (R-8th-Yucca Valley) also would modify certain timing and procedural aspects of the program in an effort to ensure that beneficiaries (police officers and their survivors) receive the full amounts to which they are entitled. School Safety: To address the recent spate of deadly school shootings, PORAC members expressed support for H.R. 5307, the School Training, Equipment and Protection (STEP) Act of 2018, which would make $50 million in federal education funding available for school safety equipment and other activities, including vulnerability assessments, active shooter training and security equipment. The bill’s sponsor, California Rep. Steve Knight (R-25th-Antelope Valley), reached out to PORAC in March and asked for the Association’s input on the legislation, as well as its support. DNA Evidence: PORAC members also discussed S. 2345/H.R. 4854, the Justice Served Act of 2018, a bill co-sponsored by Senator Feinstein that would increase the capacity of prosecutors to address the backlog of violent crime cases involving suspects identified through DNA evidence. The bill passed the House on May 15, by a vote of 377-1. Representative Justin Amash (R-Mich.) was the lone dissenter. Collective Bargaining: Members also advocated for H.R. 4846, the Public Safety Employer-Employee Cooperation Act, which would guarantee certain collective bargaining rights for state and local public safety officers by mandating that state labor laws comply with a set of minimum requirements. enough ground. The bill was supported by Jared Kushner, President Trump’s son-in-law and adviser, who visited Capitol Hill to rally support for it. Since then, a revised bill that would authorize funding for training programs to help rehabilitate prisoners was introduced in early May. The House Judiciary Committee overwhelmingly voted it out of committee on May 9. At the time this publication went to print, the bill — titled the FIRST STEP Act (S. 2795/H.R. 5682) — sits on the House floor, where it was expected to be voted upon before the Memorial Day recess. Its success in the Senate, though, remains unclear. Although Chairman Grassley prefers a comprehensive reform package, as opposed to bills that tackle only one issue at a time, he has signaled support for this legislation as a means to keep the reform process moving. If enacted, the FIRST STEP Act would authorize $50 million a year for five years to provide education and vocational training programs to prisoners, and it would allow nonviolent drug offenders to participate in the programs. It also would prohibit the shackling of pregnant female inmates and would allow inmates to earn up to 54 days of “good time” credit a year, up from 47 days a year under current law. Along with the FIRST STEP Act, the House Judiciary Committee also approved of the Protect and Serve Act (S. 2794/H.R. 5698), which would allow for the federal prosecution (under certain conditions) of those who knowingly cause or attempt to cause significant bodily injury to any law enforcement officer. The Protect and Serve Act passed the House on May 16 by a vote of 382-35. While the House appears to be moving forward with its prison reform bills, the Senate is focused on confirming judicial nominations instead of law enforcement and other legislative initiatives. As President Trump ramps up his efforts to fill the nearly 150 federal judicial vacancies across the country, the Senate Judiciary Committee — the congressional committee tasked with vetting the President’s judicial nominees — has turned its attention to filling these vacancies. Recognizing the President’s desire to reshape the federal judiciary, Chairman Grassley has prioritized holding hearings on President Trump’s nominees and getting them confirmed as quickly as possible. The chairman’s task has been made more challenging because some nominees are not getting the traditional support they usually receive from their home state senators or the American Bar Association. For example, the Judiciary Committee recently held a confirmation hearing for Ryan Bounds, an assistant United States attorney in Oregon, to become a judge on the U.S. Court of Appeals for the Ninth Circuit, the circuit with appellate jurisdiction over California’s federal district courts. The hearing took place despite the lack of support from both Oregon Senators Ron Wyden (D) and Jeff Merkley (D). The senators objected to Mr. Bounds’ college writings on sexual assault, multiculturalism and the LGBT community. As Congress heads into summer and gears up for the midterm elections in November, it will be interesting to see whether legislators turn their focus back to the more salient issues facing the law enforcement community. Federal Grants Open — Apply Now! COPS Anti-Heroin Task Force (AHTF) Program: The 2018 Anti-Heroin Task Force Program is a competitive grant program that assists local law enforcement agencies in states with high per capita levels of primary treatment admissions for both heroin and other opioids. AHTF funds are used for investigative purposes to locate or investigate illicit activities related to the distribution of heroin or unlawful distribution of prescription opioids. COPS Anti-Methamphetamine Program (CAMP): The 2018 COPS Anti-Methamphetamine Program is a competitive grant program that advances public safety by providing funds directly to state law enforcement agencies to investigate illicit activities related to the manufacture and distribution of methamphetamine. Those wishing to apply are encouraged to do so through Grants.gov by June 27. The National Institute of Justice (in partnership with the International Association of Chiefs of Police) also is accepting applications for its Law Enforcement Advancing Data and Science (LEADS) program. Those applications are due June 8. PORAC has posted additional information on these and other grants and the application procedure on its website.